Wouldn't it be great to never struggle again to have a full schedule of guitar students? Every guitar teacher wants this, but most struggle to attract a lot of students all throughout the year. You may think that if you simply advertise more, you’ll get more students. Advertising is definitely important, but it’s only half of what it takes to fill your schedule. The other half is showing your students why they should study with you instead of doing other things to improve their playing. Your guitar students want to feel like you truly care about them as human beings and that you want them to succeed. When your students feel that you care about them, they will want to study with you even if you are more expensive than other teachers in your area. They will also brag to all their friends about how cool their guitar teacher is. This helps you get new students via referrals. Tip: show that you care with actions, not words. For example: reinvest some of the money you earn from teaching guitar right back into your students. You can hold your own group events, seminars, master classes, parties or banquets exclusively for your students. Don’t charge your students for this - give it to them for free. When your students see you reinvesting your money (and time) for their benefit, they appreciate you more and build a special connection with you. Word will spread quickly about all the cool things you do for your students and your reputation will grow. As your reputation grows, attracting more students becomes easier. Most guitar students are afraid to believe in their own potential. They set very weak goals based on what they think they could achieve (instead of what they really want to achieve). For example: your students may think they only want to learn how to play a particular song, play fast guitar solos or learn to play like their favorite guitarist. Most (average) guitar teachers will try to teach their students what they say they want to learn. When the goal is reached, their students have no reason to continue lessons… so they quit. …if you simply make them aware of the possibilities available to them, help them believe in their potential and guide them through the process. Tip: have an in-depth conversation with your students about their goals before they start lessons with you. 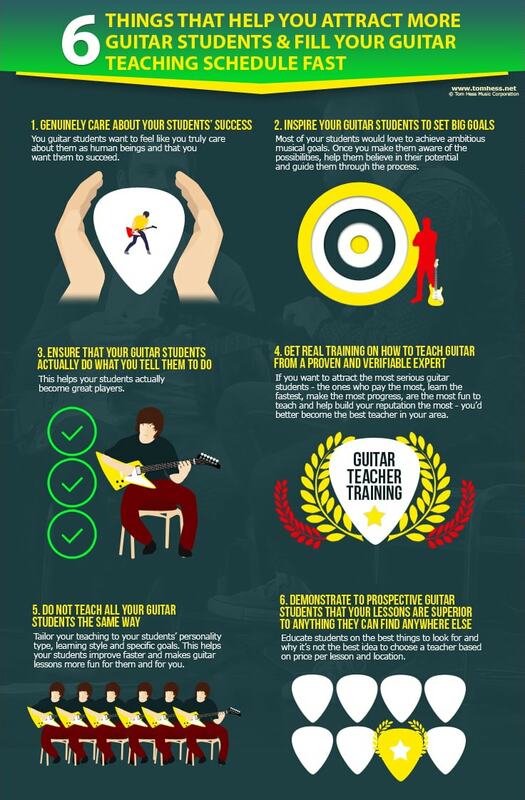 This shows your students that you care and makes them confident in choosing you as their guitar teacher. Your #1 job as a guitar teacher is to get your students to do what you tell them to do. This ensures that your students actually become great players. If you simply tell yours students what to do, most will stop practicing as soon as they feel bored and start practicing something that feels more fun. It’s frustrating when you tell your students what to do over and over but few of them actually do it. The better you are at motivating your students to practice, the faster they will improve and the faster you build your reputation as the #1 guitar teacher in your area. Imagine you are a serious guitar student looking for a guitar teacher for yourself. Would you want a guitar teacher who taught himself how to teach guitar through decades of trial and error (or by copying other teachers)? …Or would you want a teacher who actually has real training on how to teach guitar to you in the best way possible? If you want to attract the most serious guitar students - the ones who pay the most, learn the fastest, make the most progress, are the most fun to teach and help build your reputation the most - you’d better become the best teacher in your area. People are not stupid. Everybody knows that you can’t learn brain surgery by trial and error or by watching another brain surgeon. Everyone also knows that becoming a lawyer, accountant, auto mechanic, airplane pilot, cook, machinist or architect doesn't come from trial and error or by watching others do those things. guitar students for your lessons. Being an expert guitar teacher is no different. Yes, you will become a better guitar teacher with experience, but what student wants to be your laboratory rat while you experiment on them? Don't be lazy, don't be cheap, don't take shortcuts - both you and your guitar students deserve better and you know it. Get REAL training and coaching on how to teach guitar. Disclaimer: if you know anything about me, you already know I offer such expert training for guitar teachers. So you could choose to think that my only intention here is to promote my guitar teacher coaching program... It's not. You don’t have to get guitar teacher training from me. I really don't care who coaches you to become a master teacher. I'm simply telling you that you need expert training and to go out and get it, because the most successful guitar teachers out there DO have it. Every guitar student you teach is unique. To be a better teacher - tailor your teaching to your students’ personality type, learning style and specific goals. This helps your students improve faster and makes guitar lessons more fun for them and for you. Have you ever had prospective students call you and ask you what you charge for lessons and where you are located? You probably know that your location and your price don't help your students to choose the right teacher for them. Problem is, you might not know how to help your students choose a guitar teacher based on the right criteria. Show your prospective clients a list of students who already became great guitarists by studying with you. Explain that you have invested into becoming a great guitar teacher by acquiring real guitar teacher training (a credential that average guitar teachers do not have). Note: this is NOT the same (and is far better than) having a ‘music degree’, since a music degree doesn't help you in any way to be an effective ‘teacher’. Teach in innovative formats (not only private lessons) that will help your students to progress more quickly. Clearly explain to your students the additional benefits these formats will give them. Be an ‘expert’ in the style your students want to learn (rather than a jack of all trades guitar teacher). Your prospective students will clearly see that you really ARE the only option for them. Other guitar teachers in your area will lose a lot of students as word gets around that it is YOU who helps guitarists reach their goals faster than anybody else. The next step to filling your teaching schedule is learn how to apply these strategies in your business and begin attracting new students today. Download this guitar teaching eGuide to learn how to attract new students like a magnet and make them excited to start lessons with you. Learn even more powerful methods to help you get guitar students fast for your guitar teaching business.